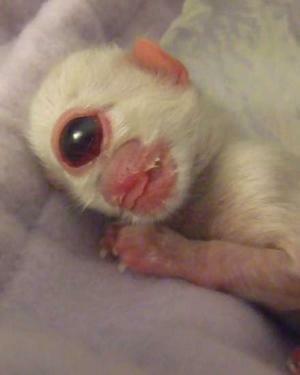 The kitty and its creepy eye are captured in a startling Associated Press photo, and it’s no hoax. Scientists say so, terming the facial mishap “holoprosencephaly.” Named Cy by its owner, it was born Dec. 28 in Oregon and died the next day. It was also born without a nose, making it look to some like a one-eyed monkey. Cy was one in a litter of two kittens. Its sibling came out normal and is presumably destroying furniture as we write. With that impressive peeper, Cy was the kitten’s pajamas last week. Its image held Net surfers in the queasy thrall of morbid fascination. The photo of the pink and white feline — laying on a bed of horror and pathos, the outsize uni-eye centered in its downy head — shot through the blogosphere. That’s glib stuff when deeper reflection is demanded. Cy represents the crazy fragility of life, the cruel caprice of Mother Nature. And it throws into question Cy’s mother’s taste in tomcats. Cy is gone now. A fleeting oddity that ruffled us for a moment. A sideshow distraction that made us feel and think. Cy’s owner did what anyone would do with such a gift and learning tool for humanity. She put it in the freezer.